We also want to help you set your booth up for success before Black Friday, so Thanksgiving can be spent relaxing with peace of mind. Today, we’re here to share three things you can “set and forget” for Black Friday: TurboTraffic, Customer Marketing Campaigns, and booth coupons. Looking for a way to boost traffic to your booth just in time for the holidays? Try a TurboTraffic pack. A long-time Bonanza seller favorite, TurboTraffic works in tandem with our advertising program to get maximum exposure for your store and listings. Platinum and Titan receive TurboTraffic as a perk of their membership plan, but all sellers can enjoy the rewards of TurboTraffic. We offer individual TurboTraffic packs to all sellers for $24.95 per pack. Is TurboTraffic worth it? Last year’s holiday numbers speak for themselves! On average, sellers who purchased TurboTraffic between November 15th and December 15th saw page view increases of 162% while their revenue increased by 257%. We want TurboTraffic to be as accessible as possible. Soon, sellers will be able to use their reward tokens to purchase TurboTraffic packs! A TurboTraffic pack will cost 10,000 tokens, and tokens cannot be combined with other payment methods. This addition will be rolled out over the next couple of weeks. To use tokens to pay for TurboTraffic once live, visit your TurboTraffic dashboard and select “Get more traffic.” If you have enough tokens to complete the purchase, you’ll see the option to use tokens as your payment method. Tokens can be earned every day just by visiting your rewards dashboard. You also earn tokens when you unlock profile badges, and we periodically send out seller survey opportunities that come with token rewards. Ready to try TurboTraffic and boost your exposure for the holiday shopping rush? Purchase a TurboTraffic pack today. We’ve said it before, and we’ll say it again: building customer loyalty is a cornerstone of long-term business success. That’s why we created the Customer Marketing Tool (CMT). This free feature allows you to create special campaigns for your customers based on just about anything: when they made a purchase, how much they spent, and what categories they made purchases from, to name a few. Set your marketing lists to automatically update and add new subscribers who fit the criteria of the list. The best part about this tool? Sales made from CMT coupons are commission free. To make this tool even easier to use, we’ve created a pre-made campaign template – available for a limited time! – that’s designed to offer savings to your customers during the busy Black Friday weekend. To promote your booth to your buyers in time for the shopping season, simply create a new campaign using our Black Friday Shopping template. Want to customize your campaign? Click “Select” when hovering and you can alter the discount percentage or audience to fit your needs. Once you publish your campaign, it will be visible for your selected audience on their account dashboard and on the “My Seller Coupons” page. Users who have opted into email announcements will receive campaigns in emails, as well. 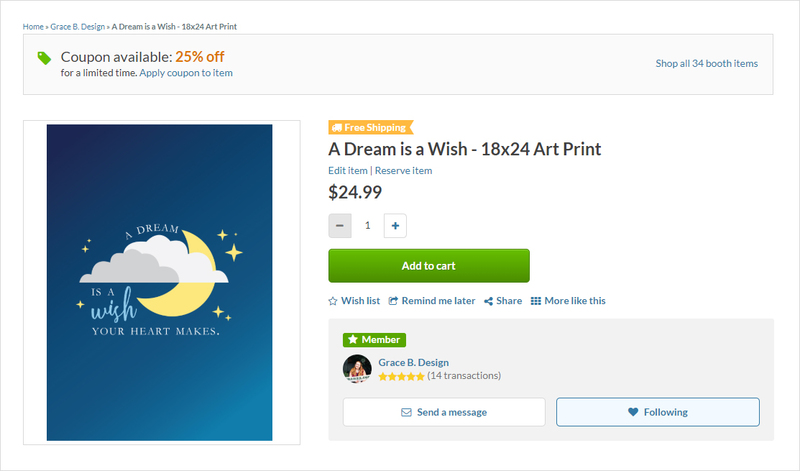 Creating custom coupons is a great way to promote the items you have for sale, especially during Black Friday weekend when shoppers are hunting for major deals. This holiday season, we’ll be promoting discounted items & coupons in the hand-picked lists featured on our homepage. To publish a coupon, visit the Discounts & Coupons tab of your booth settings. You can choose to create a percentage discount or specify a dollar amount off the item listing price. Once a coupon is published, it will show on our Coupons and Deals page, as well as at the top of your item listing pages. TurboTraffic, Customer Marketing Campaigns, and booth coupons are a few of our favorite things designed to drive buyer traffic to your booth this holiday season. Got any other tips for your fellow Bonanza sellers? Sound off below or head over to the community boards!